Share the post "Stock markets are tanking, but BTC remains range bound"
Once reporters stop interviewing screaming traders on the floor of Wall Street, a few of the wiser ones may soon speak with market veterans that have survived a correction or two or three. When approached, these saner minds remind everyone that the last correction was over two years back. It is healthy for Bull markets to allow profit takers to record gains, while new investors board the train. A ten per cent drop is not a major correction by any means. When the decline is in the 15 to 20% area, we might then be able to conclude that this record-setting Bull market has no more room to run. In the meantime, Bitcoin has held its own amidst the perceived carnage in equities and bonds. It actually is a very good sign. Money managers typically devote 5 to 10% of a portfolio, depending upon their tolerance for risk, into what are called “special situations”, i.e., items with high-risk profiles and longer payoff timelines. When times get tough or at yearend tax-planning time, investors are more prone than not to liquidate their high-risk items. If they also receive margin calls during a market collapse, ordinarily they would sell holdings like cryptocurrencies first, but that does not seem to be the case. Bitcoin, however, has been range-bound for several months, bouncing between $6,800 and $6,300. Oddly enough, the shift to safer climes within the cryptocurrency space has also been observed. Per one analyst: “BTC is expected to outperform other cryptocurrencies. 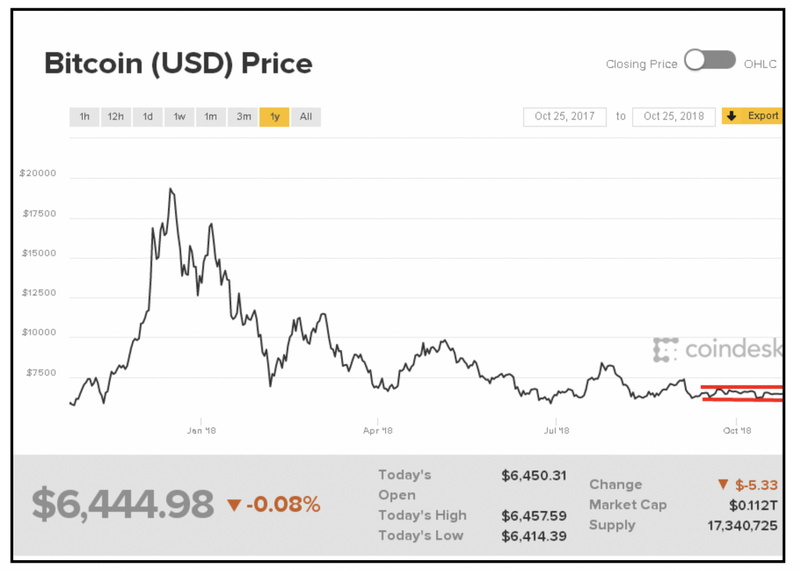 During times of stress, investors tend to move money out of high-risk alternative cryptocurrencies and into safer options like BTC. The risk appetite will likely improve if BTC sees an upside break of the trading range, in which case, prices may rise toward $6,800.” For the time being, altcoins seem to be holding their own, as well. If the new ETF comes to pass, it could open a new door to countless retail investors.